Pokémon Sun and Moon is the latest installment in the popular Pokémon video game series for the Nintendo 3DS. 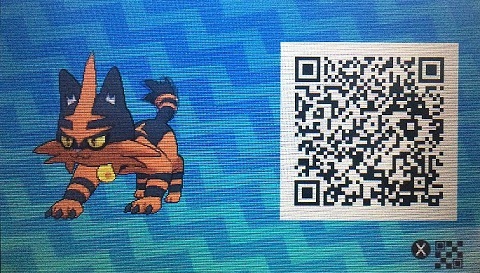 The game brings a lot of new features to the franchise and the QR Scanner is one of them. It uses a QR Codes scanner to add information to its Rotom Dex, including the location of new Pokémon. Check out how to use QR Code to find rare Pokémon in the game. The QR Scanner allows you to view information about Pokémon through a QR Code. By scanning the code, the Pokémon and their forms, both shiny as the "megaform", will be recorded in the Pokédex and you can see your location on the map. You accumulate points while scanning the codes. To get 100 points, equivalent to ten scanned QR codes, you can use another feature, called "Island Scanner". For about an hour, a rare Pokémon will appear in "Alola" and you will have a chance to capture it. Step 1. Press "Y" to open the menu and click the "QR Scanner". Step 2. Open the QR Code on a friend's computer, cell phone or 3DS. Use the top screen with the camera to select it and press the search button to scan. Step 3. The code will be scanned and you will receive 10 points in the QR Scanner. The Pokémon will be registered in your Pokédex, along with your data and location. To find it on the map, open the Pokédex, choose the Pokémon and press "A" to see the location. Step 4. Now, to use the "Scan Island," you must get 100 points. Scan QR Codes more to complete ten, and then click "Scan Island". Step 5. The shadow of a Pokémon considered rare in the "Alola" region will appear on the screen. You will have an hour to find it at the location indicated by the "Island Scan". However, to carry out other "Island Scan" you will have to wait. Every two hours you can scan another QR Code and thus complete the 100 points again. This also prevents players from abusing the tool to find rare Pokémon. You can also share a QR Code with your friends - but only the Pokémon you've captured. Open your Pokédex and choose one of the little monsters from the list. Then press "X" to create a QR Code on the upper screen. Now, just another person uses the QR Scanner with another 3DS to add it to his own Pokédex.